Everyone has natural inherent talents and abilities. The IDAK Online Talent Discovery Guide is perhaps the most effective resource available to identify and evaluate your natural talents and match them to the ideal job positions. This service is a based upon the talent assessment approach described in IDAK founder, John Bradley’s ground-breaking book, Discovering Your Natural Talents. 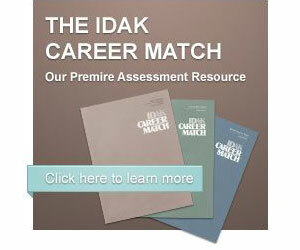 Go to our IDAK Online Talent Discovery Guide Take the test today!